Hi there! Happy Monday! Welcome to Fat Quarter Shop and Me and My Sister's Makin' it Cute Day! What is the Makin' it Cute Petal Pack? 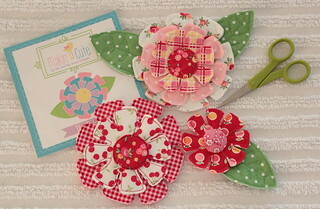 It's a cute set of templates for 3 different size flowers, a center circle and a pretty leaf. 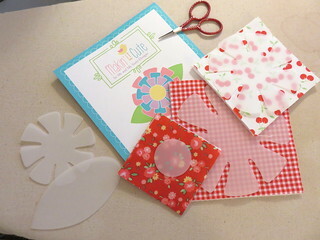 The templates come with a nice simple set of instructions explaining how to make pretty dimensional flowers from felt or fabric and batting. 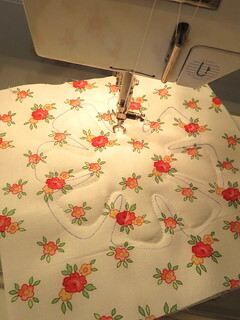 You simply trace the template onto your fabric with a temporary marker, sew inside the line and cut out on the line. I stitched with my regular sewing foot, then tried free motion stitching and it was really fast and fun. I made several flowers and leaves. For the leaves I did some free motion lines down the center to make them leafier! I also tried blanket stitching the center of one flower onto the petals to have a puffy center. And look how cute that covered button looks, I used the flower center template to cute my circle for the button. There are so many fun possibilities with these templates, I feel like I've just gotten started. I hope you'll hop on over to see what Fat Quarter Shop and Mary and Barb are up to today and to see who else is Makin' it Cute! There just might be a give away going on! So that' s it for today. 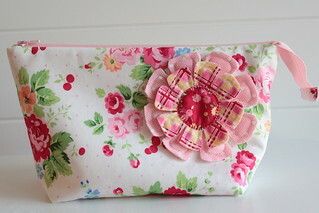 Just look how extra-cute my Noodlehead Open Wide Zipper Pouch is with my Makin' it Cute Flowers! Now.. remember head over to the Jolly Jabber and check it out! Your flowers are so cute. Fingers crossed that I win a set over on Jolly Jabber! That is so cute! But so is everything you make!! THAT is adorable! Sew cute! Your flower looks gorgeous on your pouch. Extra CUTE is so right as are the Makin' it Cute Flowers. The word CUTE gave me a good deja vu laugh about the day my youngest granddaughter walked into my wardrobe closet after announcing she was going to find me "SOMETHING CUTE TO WEAR" so we could go shopping! Just too cute, love it on the little zipper bag. These are so much fun in your fabrics! And the covered button center is a nice touch! I knew yours would be my favorite--adorable! Love the fabrics you used. It turned out really cute, and your zip bag is adorable!! Your pouch is super cute! The flower sets it off perfectly. Love your little pouch. The flower just makes it extra special. Super cute. Of course your fabric makes it pop. My girls love their bags. Allison tried to trick Laurie out of the home pillow but it didn't work.